Jack B. Moore was appointed to the University of Houston System Board of Regents by Governor Greg Abbott in 2018 for a six-year term and will serve through August 31, 2023. For fiscal year 2018-2019, he will serve as a member of the Academic and Student Success Committee, the Endowment Management Committee and the Facilities, Construction and Master Planning Committee. Moore most recently served as President and CEO of Cameron International Corporation from April 2008 to October 2015 and served as Chairman of the Board of Cameron from May 2011 until it was acquired by Schlumberger in April 2016. Moore served as Cameron's President and COO from January 2007 to April 2008. Moore joined Cameron in 1999 and, prior to that, held various management position at Baker Hughes Incorporated, where he was employed for over 20 years. 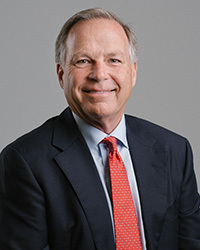 He currently serves on the Board of Directors of Occidental Petroleum Company, KBR, Rowan Companies plc, and Propetro Holdings.Moore also serves in leadership positiions with the United Way of Greater Houston, American Heart Association, memorial Assistance Ministries and the University of Houston's Board of Visitors.Moore earned his BBA in 1977 from the University of Houston and the Advanced Management Program at Harvard Business School.